The red line is for Insider selling. They were big sellers in 2000, again in ’07, and again now. Whatever you may think of the character of corporate executives using company cash to buy expensive stock, while getting out of their own stock, you have to admit their record of self-servingly selling at tops and buying at bottoms is impeccable. I think it’s scurrilous. It does the shareholder no good at all to have their companies loaded up with debt to buy stock at top dollar. The notion that the company is reducing its share float is a damn lie. Said shares become treasury stock, which then can be issued to these sociopathic execs at a later date as stock options. But then, it’s not illegal. Small comfort, right? Based on my Elliott Wave Count, together with data on investor sentiment and momentum, I’m giving an eighty percent probability that the upward corrective action in stocks since the January 9th low is about over. If so, the next wave down should be severe, taking the Dow Jones Industrial Average down below 18,000 (presently 24,700 or so) to the next pause to consolidate the losses. I am looking at this pattern as a bear market of Grand Supercycle degree of trend. The ultimate low should be below 3,000, several years out. I get arguments counter to my analysis from two sources: The financial advisory industry, and friends who are successful businessmen and professionals outside of the investment industry. Banks, brokers and financial advisors are of one mind: citing the present strength in the global economy, they tell us the next biggest move in stocks will be up. I counter that with the historical truth: at major turning points everything looks great, and it is the market, not the economy that changes direction first. I don’t ask what form of analysis they use to come to their conclusion. I don’t think there is one. They just don’t “feel” like my forecast can be logical. So, what about the 20% probability that I’m wrong? Well, there is an outside chance that the selloff since January 26th is just another correction in an ongoing bull market, and we will have another leg up. But getting to that conclusion puts all kinds of torturous requirements on the wave count. I’d really rather say I’m 100% certain a crash is coming in a few market hours. But that’s not a good way to think. If I owned any stocks (I don’t), I’d use the February 9 low of 23,360 in the DJIA as my stop point, and liquidate everything I owned if it got below. As long time readers know, I write these essays to help me frame reality for myself and to give my family and friends something to think about. I do not make recommendations. What you do with this information is your business. Posted in On Markets	| Comments Off on Bear Market Resuming? This wont take long: stock owners should be aware that the U.S. stock market is now in the process of coming to a catastrophic end. Rising hundreds of points day after day turns an investment arena into a gambling den with no regard for sanity or value. A couple of weeks ago, the extent of the radical part of the advance, known as a “throw over,” looked similar to the final run up into the 1929 top, which reversed violently, cutting the market in half in days and, after a countertrend rally into early 1930, collapsed, ending in an 89% loss in the value of the Dow Jones Industrial Average. 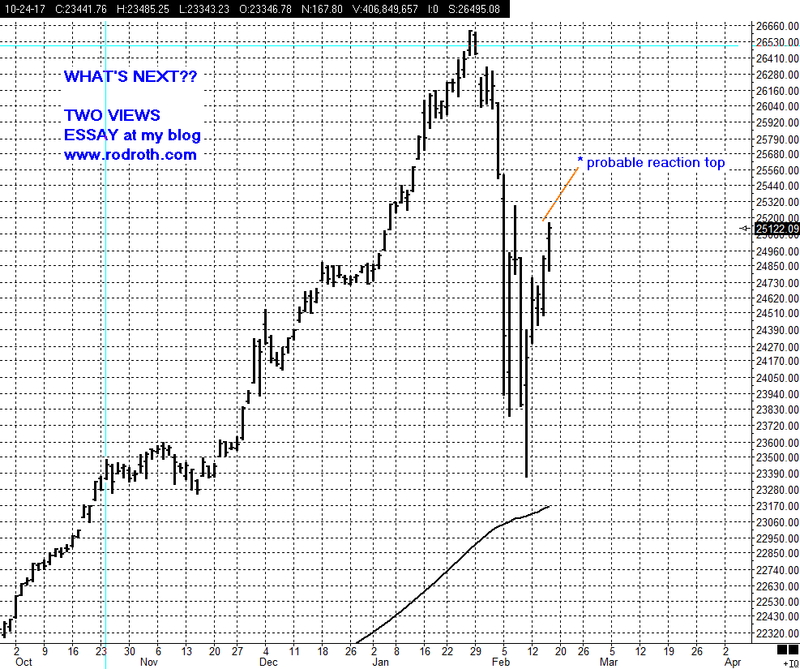 Now, the shape of this run up is starting to look like the South Sea Bubble in the early 1700s. I will not be surprised if the market shoots up another two thousand points in just a few days. 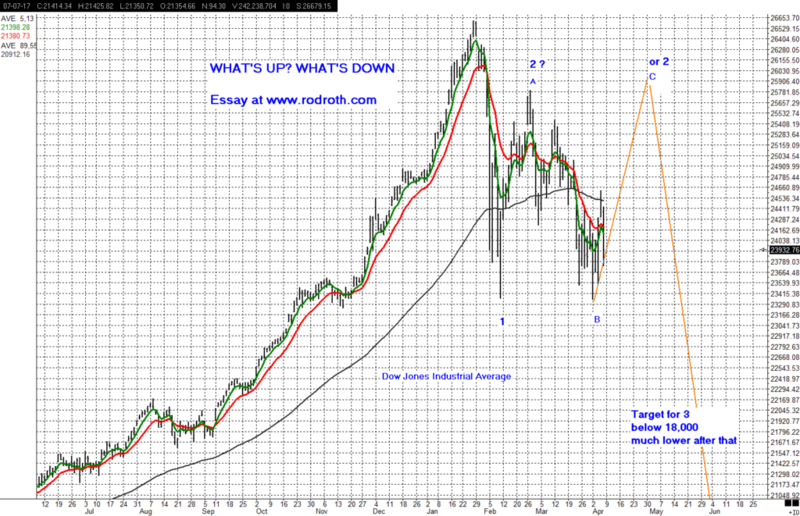 There is a valid Elliott Wave projection of 28,272 in Dow Jones Average. This is probabilistic, of course, not necessarily a firm target. At this point, based on my studies, I allow for an acceleration in the rise, but fully expect that the top will be sudden and the reversal to be extremely violent. I do not think the reversal is very far out in time. Who will be affected? Everyone who has stocks in retirement accounts or who will be depending on state and city government employee pension plans first. Later, businesses, professional practices, real estate investors and, well, everyone you know. It is definitely a time to head into the bunkers. I believe that cash is the only thing to hold in investment accounts at a time like this. Bitcoin is a digital asset, that is, its existence is in the form of digital code. There is no physical specie. It is designed as an alternative for government issue money, serving as a unit of account, a medium of exchange, and a store of value. Acquiring the stuff is complicated, but not impossible. Wikipedia estimates that there are over 5 million users/owners of Bitcoin, and several hundred thousand users of other cryptocurrencies (the generic term for the instrument). But the interest in these things is growing so rapidly that any number applied to owners is going to be dated as soon as it is cited. How well does Bitcoin work as money? As a unit of account, perfectly. One Bitcoin has one million bits. As a medium of exchange? Over 100,000 businesses accept Bitcoins for goods and services. You can pay for pizza with Bitcoins at Papa John’s. As a store of value? Ah, there’s the rub. 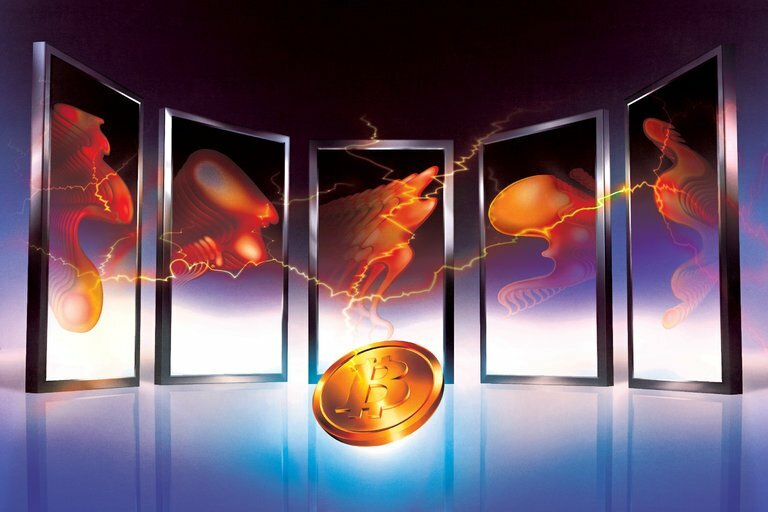 The potential for Bitcoin to be a store of value lies in its scarcity. Only 21 million Bitcoins will ever be issued, so, as long as there is interest in owning cryptocurrencies, an owner can be assured that the coins will not be debased by more printing. However, whether it works for you depends on what you pay for it, and what it is worth when you want to sell it or use it to pay for something. Since Wiki’s post (last August), the price has run up to $20,000 and back down to $10,000. Bitcoin no longer serves as a storage of value. So why own it? These days, mainly to keep asset ownership and transactions totally private, out of the view of government. It is said that the deep drug industry owns tons of cryptocurrencies. Most of the interest today is from folks who want to get rich buying and selling the stuff. Speculative interest is exploding, and the financial industry is making it easy–you don’t even have to buy Bitcoins, you can trade futures in them, Lovely. Because of the volatility, it truly is an excellent trading vehicle for a competent trader. Not many of those around, but there is no dearth of wannabes. Good luck, if that’s you. Buy low, sell high–that’s the idea, anyway. 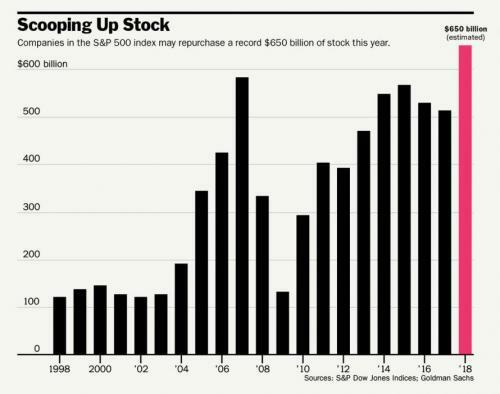 A rational buy-and-hold investment strategy, cultivated by persistent increases over several decades, has come to a frightening moment in the U. S. stock market. The Dow Jones Industrial Average has soared over ten thousand points in twenty two months, a near seventy percent increase without so much as a two percent correction, on top of a tripling in price off the lows in 2009. 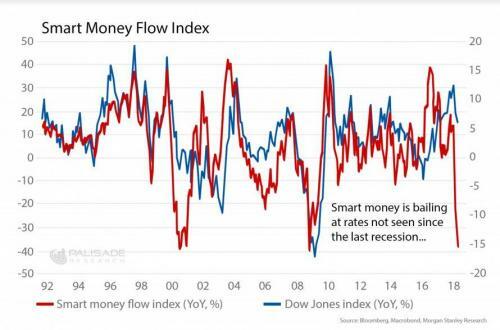 This is a mania phase, where the unconscious herding impulse, always at work in uncertainty, morphs into the mindless conviction that the risk is not in owning stocks, the risk is not owning them (think about that for a minute). The great irony in bull markets is that they sometimes end in a huge spike, driven emotionally by the fear of missing the boat. Anyone who owns stocks today, while possibly somewhat concerned about the fast rise, is unwittingly possessed of this fear that, if they cash in, the market is sure to run off and leave them. This is how it ends. When it’s over, the market crashes violently. Always. It should terrify anyone who owns stocks today. Unfortunately, if they start to fear a crash, their main concern is, can the market go higher before it crashes? Yes, of course it can, and probably will. But they will panic. They will agonize and hang on until the day when their holdings are down seventy percent. They will decide they can’t take anymore. They will call their advisor’s office during the lunch hour and instruct the advisor’s assistant to liquidate the account because now, the fear of missing the boat has been replaced by the fear of losing what is left. 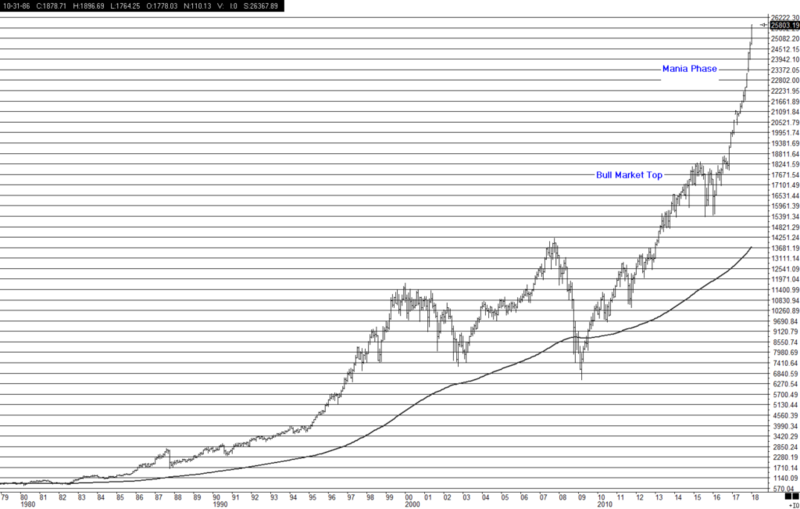 This market top is of one degree higher in trend than the top in 1929. The next few years will be more difficult than the 30s. I’ve written about this in earlier posts and the market continued to climb. The case is very compelling for my view that a Grand Supercycle bear market will soon get underway and, after the initial crash, stage a countertrend rally for a bit, and then tail off in a poor, poor market that will last for a number of years. In a panic, the first to panic wins. and all eternity, even God. will settle for two eggs, over easy. Riffing on my favorite TV meteorologist (Look it this picture, folks, isn’t Hurricane Zenia a beauty? Great looking storm, and she’s only a cat 4 now, should be a 5 when she crushes us tomorrow), I have to tell you, this is not just any old stock market top, it’s the most phenomenal top I’ve ever seen. Ever. In all of history. When it starts down, there will be no hiding from it. Gonna send us all into the poorhouse, whether we own stock or not. There, I’ve said it, and that’s the last pessimistic comment I’ll make until along about 2025, give or take a decade, when the ensuing bear market hits bottom. It is reasonable to lean against the prevailing view when things get over done. This is something I’ve been doing, as you know. I’m going to jump the gun (and quite possibly be wrong) this afternoon. 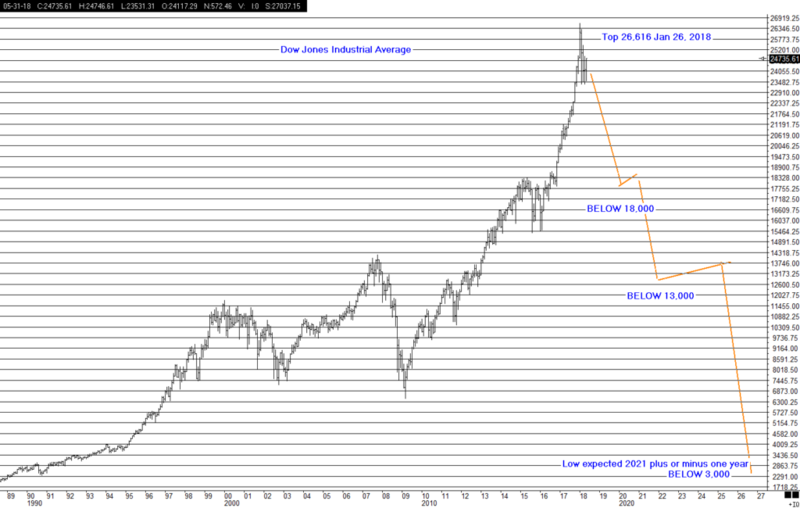 It appears that the last few squiggles in the Dow Jones Industrial Average are tracing out an ending diagonal triangle. It is a news based rally, the news being that the tax bill has enough votes to pass. Hooray, you say–more money for rich people who will do nothing for the economy, more money for corporations, who will pay out more dividends to rich people and do nothing for job creation, and, of course, less money for anyone who works for a living. Adding to the “good” news is the consensus of Wall Street economists and strategists that the economy and the markets will do swimmingly well in 2018. Investor optimism has not been this high since 2007. Valuations are in the clouds. investment portfolios have the highest allocation to stocks, and the lowest to cash since records have been kept. And, as always in a major speculative market top, there is an irresistible bubble to stir the animal spirits. Bitcoin, a cryptocurrency, can now be traded in the futures exchanges, a sure marker for a long term top in something that millions want to buy, even they don’t know what it is. The following is quoted from the August 4, 2017 issue of The Elliott Wave Theorist. Permission granted by Bob Prechter, author. We should note that, while the initial crash took 50% off the value of the Dow, the ultimate low in 1932 resulted in an 89% loss in the Average, and hundreds of bankruptcies in both public and private companies in the depression that followed. None of this was forecasted by the general population of market analysts and strategists. Quite to the contrary, the majority of them were optimistic, and bullish in the extreme right up to the end. It is the same today. The very same. The ideal time for the top is now. The ideal price range for the Dow Jones Industrial Average is 23,000 plus or minus a couple hundred points, the range it is in now. October is a popular month for crashes.